Can't attend? Follow Woods in the Books to know of future events! 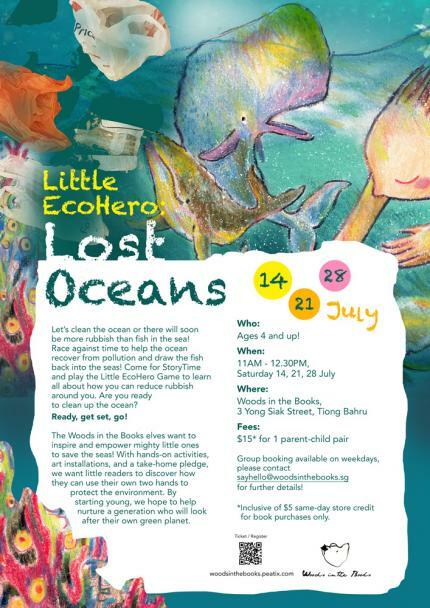 The Woods in the Books elves want to inspire and empower mighty little ones to save the seas! With hands-on activities, art installations, and a take-home pledge, we want little readers to discover how they can use their own two hands to protect the environment. By starting young, we hope to help nurture a generation who will look after their own green planet. Group booking available on weekdays, please contact sayhello@woodsinthebooks.sg for further details! *Inclusive of $5 same-day store credit for book purchases only.